This is an ultimate climbing adventure! Only for the bravest....or the craziest, to put it so. You will be climbing big wall routes in the National park Paklenica with experienced and highly reliable ADV guide. Big Wall climbing is no joke. We're talking serious now. This one is for the true adventurers only! Every mountaineer here knows of the stone giant. Anića Kuk is the name he is known for. 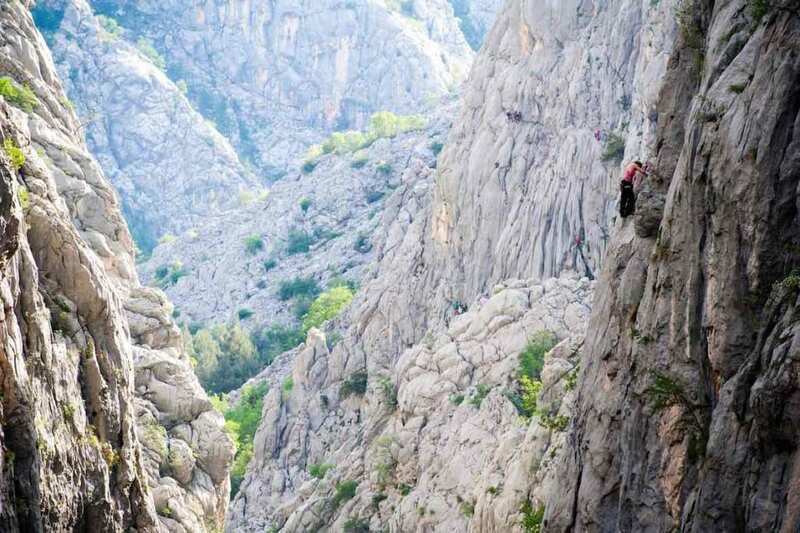 His 350 meters altitude massive rules the great canyon of Paklenica National Park. It's his face that's been settling down in any climber's dream. The giant enjoys company and he likes to play. He treats climbers gently, like the children of his own, asking for nothing but respect in return. And climbers too like the game, been playing it for decades now. With each generation the new rules come. So, he's not so wild anymore. Been bolted all upside down. With more then a hundred routes, his face is something of a playground now, but only for brave and only for strong. The ones eager to play the game of big wall in the greatest temple of them all. What can I expect on this adventure? 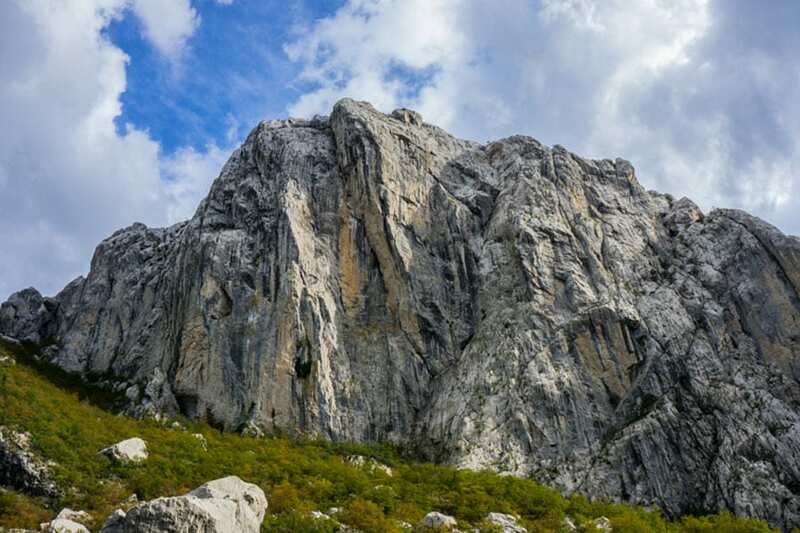 The impressive 350 meter high wall of Anića Kuk, among other beautiful scenic routes, has always been a proving ground for alpinists from all over the globe. 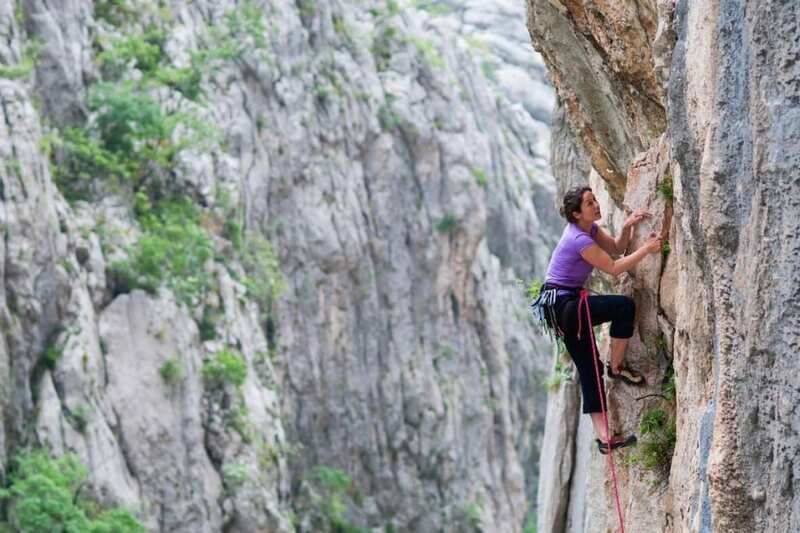 Based on your climbing experience, abilities and personal preferences, we offer a Lead or a partner One on One climbing tour through the Paklenica canyon, a place of exceptional beauty. We don't recommend big wall if you never climbed or at least belayed before. Not because we doubt your capabilities, but because there is not enough time to master the basics plus climb in pair twelve pitches in a single day. Don't want the night to catch you while still climbing. 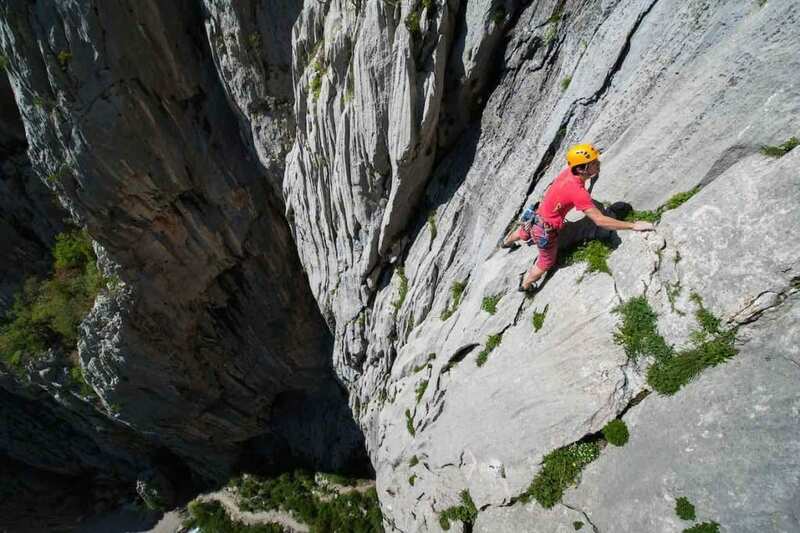 Most of the routes in Crag of Anića Kuk are 350 meters long, divided into sections of twelve to fourteen pitches. All the big wall routes in ADV catalog are well bolted with fixed anchores at the top of each pitch. There are many trad routes around, but bolts refer better to a safety-first rule. Climbing starts as early in the morning as possible and – depending on your performance – takes a whole day to send a complete route. Your guide's job is to lead all the pitches and belay guest's climb as a second. That way we produce the safest partnership where the guest is top-ropping all the pitches. ADV guides use autoblocking belay systems which catch your possible fall automaticaly. Your job is to belay a leader and take all the pieces of gear the leader has set up while leading the pitch. This is quite a responsible role. You don't want to leave any piece of gear behind you because it might be that exact piece you need to finish the route. Trust us, once you touch the perfect limestone of Paklenica for the first time, a big smile of your adventure will be hard to wipe off. Are you ready for your big wall experience? 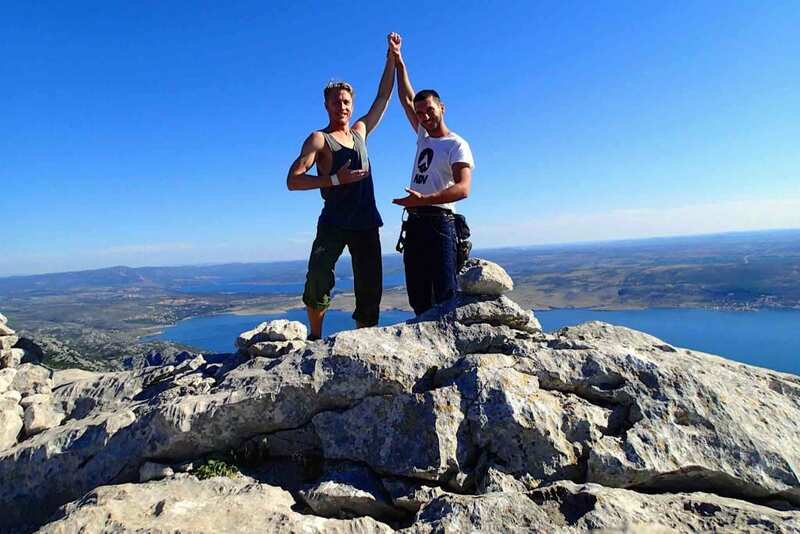 If you want to take it step by step check our beginner free climbing tour in Paklenica. After a short intruduction, we'll head toward a parking lot. Acces to all routes in Anića Kuk is approximately 45 to 60 minutes hike from a parking lot. Make sure to bring anough water and food (sandwiches, snacks, fruit) for the day. ADV provides all the gear and first aid sack, but you might also need some light windstop and a lamp if by any chance dark catches us climbing. While hiking to acces the crag of Anića Kuk, your guide will be interested in hearing all about your previous climbing experience. Anything you feel to mention, please do. Potential problems in performance or cummunication are to be prevented now, not later. You are also allowed to overload your guide with questions on multipitch climbing and specific route you two arranged for the day. 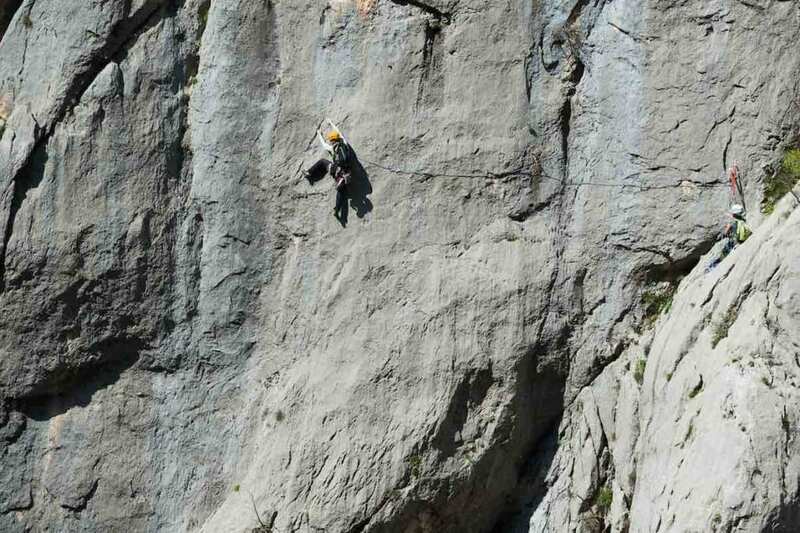 Any lack of information from both sides can lead into a climbing catastrophe. It is a guide's job to lead all the pitches for you, but in case you are familiar with leading a multipitch it is also possible to change in leading. It's an option your guide will decide about at the face of the place, after you provide him a necessary data. Even if you are a skilled multipitch climber, a problem might be an orientation. There are so many routes in Anića Kuk, it's easy to mistaken your route for another one just following the bolts and not perceiving the point they crossed. Descent from the top of all routes in Anića Kuk is one hour hike. There is no need for rapelling. Hike is not hard, but it is also not an easy, relaxed walk. Watch your step and follow your guide's instructions until you both reach the safe base of a crag. Once you got back at the bottom of a canyon, it's time to finally relax. Spending a whole day in absolute focus on your every move, the feeling will be quite out-of-place. Sudden need to relieve might occur. A cold drink and relaxing is a medicament ADV strongly advises to settle the emotions at the end of your big-wall adventure. After an exciting climbing day, you can lay back with your instructor and share your impressions with him.